This article traces our collective experiences as a photographer, a journalist and an academic engaged in the process of documenting the lives of South Africa's grandmothers - who are confronting the HIV/AIDS pandemic while carrying an immense history of social struggle in the apartheid era. 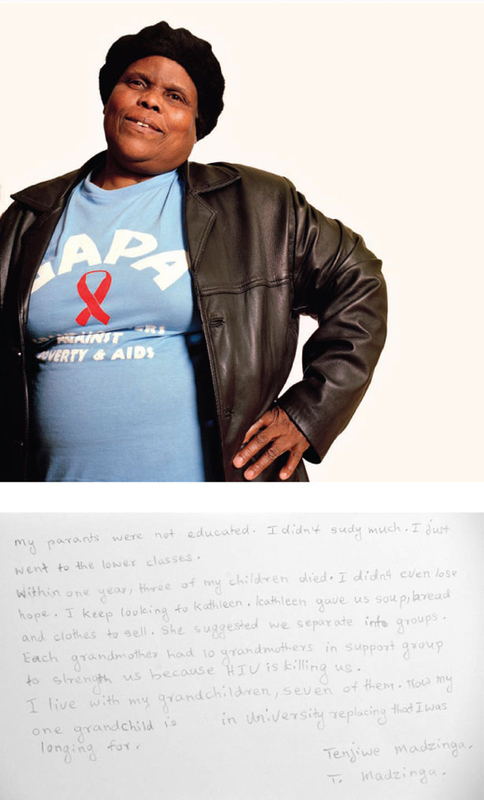 We set out with individual aspirations to record, in visual and narrative forms, the life stories and lived experiences of members of the Grandmothers Against Poverty and AIDS (GAPA) organization based in Khayelitsha, Cape Town. Over the course of three years of building relationships and working with leaders of this organisation, we developed a social documentation project that involved a series of individual portraits, family photographs, longitudinal life narratives, organizational ethnographies and film footage. Collectively, this data formed the foundation for 'The Nevergiveups' photo exhibition at the District Six Museum and the Khayelitsha Community Centre in June 2011. This installation emerged as a collective, international effort to promote wider awareness of the significance and particularity of the juncture many South African grandmothers face - between the trauma of a collective memory of apartheid and the contemporary HIV/AIDS crisis. This project emerged in a distinct approach that combined social documentation with scholar-activism - as our professional spheres as journalist, photographer and academic sociologist intersected in a larger shared pursuit of contributing to a social documentation and activist project that would provide an archival record of South African grandmothers' lives through the elder women members of GAPA. The extraordinariness of the grandmothers crept up on us stealthily. The process started as a one-off story for a local newspaper. 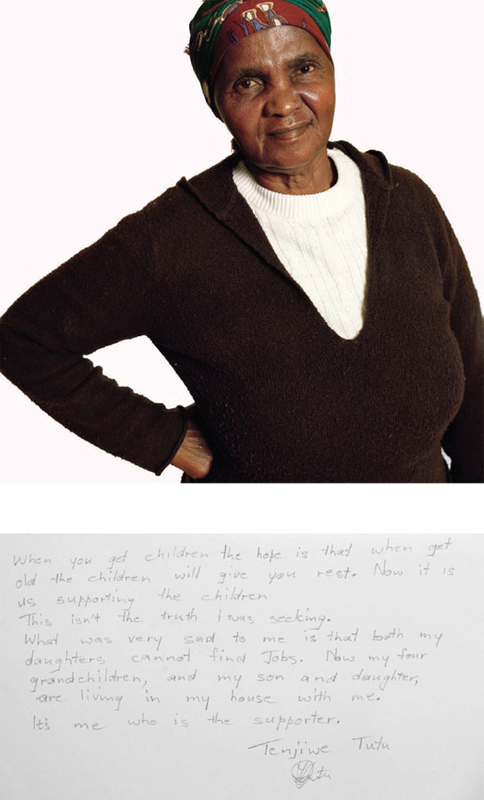 Jo-Anne Smetherham, the writer, needed photos to accompany a daily newspaper piece about the work of Grandmothers Against Poverty and AIDS, a Cape Town NGO focused on supporting grandmothers and the issues confronting elder women in the face of the HIV/AIDS pandemic. 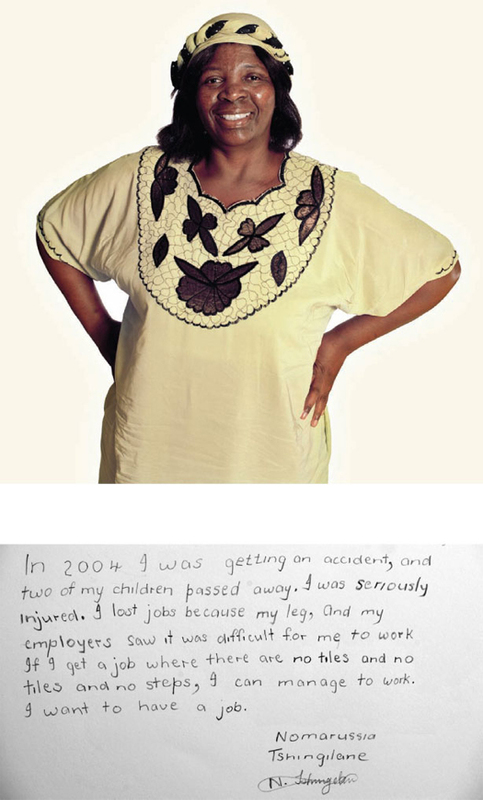 Subsequently, a series of photos and narratives gathered during a 'day in the life' journalists' encounter grew into a story for the local women's magazine, Femina, which wanted a focus on one woman as a representation of the lives of South Africa's grandmothers. 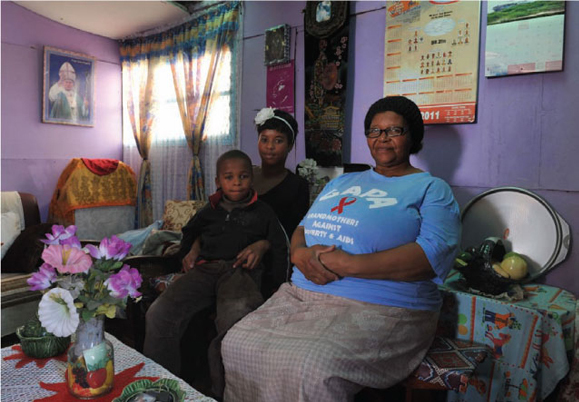 Our encounter with the grandmothers soon led to a realisation that they represented a powerful window into the consequences of the AIDS pandemic, in ways that had not yet been documented within South Africa. It later dawned on us that the women we were engaging possessed a unique 'institutional memory', or perhaps rather a 'social memory', of the journey South Africa had taken during their lifetime. They held, individually and collectively, knowledge and memories of a certain segment of contemporary South African history beginning before the Nationalist Party-dominated apartheid period - a time when a large proportion of the population of the Eastern Cape still lived in accordance with long time tradition and history - stretching through the period of the rise and dominance of the Apartheid regime, to its collapse in the late 1980s and early 1990s, and the subsequent transition to a free and democratic South Africa. Having lived through this period they had faced the serial challenges of repression, segregation, rural hunger, translocation and migration into urban areas, poverty and ultimately the HIV/AIDS and crime pandemics that have characterised the country in the new millennium. The GAPA grandmothers still remember their hopes and dreams, their childhood experiences and adult disappointments, small victories clawed back from circumstances often beyond their control. There was a point when I decided that I wanted to engage beyond the scope of this initial assignment and create a series of photographic portraits of the group. 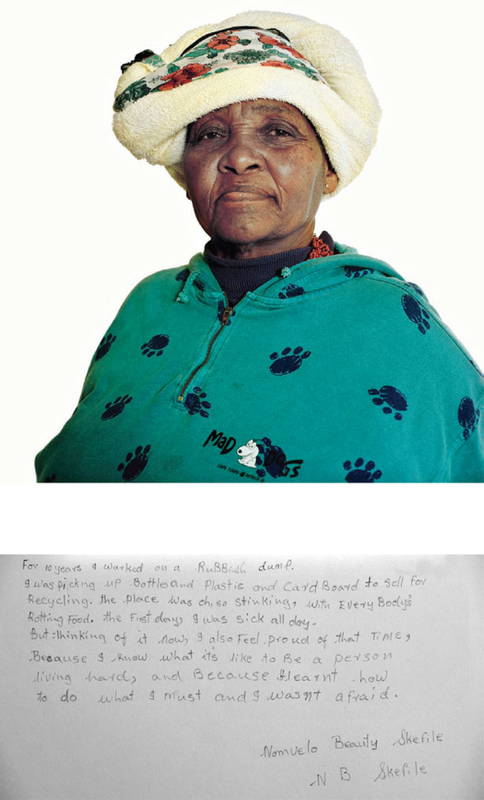 My intention was to capture, in more concrete and compelling visual terms, the complexity, beauty, continued struggle and lived histories of a microcosm of South Africa's grandmothers. To this end I arranged a meeting where all GAPA members who wanted to participate in the 'portrait photo' project were invited to attend an information meeting. Here Althea Barry, the GAPA Occupational Therapist, and I explained the intentions of this project, and gauged grandmothers' interest in sharing their life experiences in more depth through both visual and narrative forms. I also wanted to check one fundamental assumption: that they had all shared a common desire - like my grandmother, your grandmother and millions of other elderly women across the globe - to enter their later years being cared for, loved and doted on by their children and grandchildren. The meeting we convened hammered this home to us. Certainly, they had held these dreams since childhood. Regrettably, as I documented the lives of seventeen GAPA grandmothers, most of their stories clearly illustrated how their current realities remain at odds with these expectations and hopes. Yet they poured their stories out during this meeting that increasingly felt more like a group therapy session and spilled over the one-hour scheduled duration to over four and half emotionally gruelling hours - stories and experiences of hopes dashed, expectations not met, and pain and disappointments. In the course of this session, grandmothers shuffled across the room, clutching tissues to help each other staunch the flow of tears. For some, it was the first time they had heard these stories from the others. 'I didn't realise that had happened to you ...,' sympathised one grandmother to another. It was a refrain heard several times that afternoon. The longer I spent with these extraordinary women, the stronger became my commitment to attempt to document the depth and complexity of their lives. Seventeen grandmothers attended that session; all seventeen agreed to be part of the portrait project. I made two technical choices regarding the shoot. Firstly, I abandoned my digital cameras and took out a medium format film camera, a Hasselblad, to shoot the portraits. The use of this camera created several de facto constraints on me, as well as opening new possibilities. Unlike the almost limitless exposures available with a digital camera, with the medium format camera I limited myself to one roll of film per person (12 exposures). In addition, the square format of the Hasselblad, which I have rarely used since 'going digital', forced on me a different, more conscious view of the world from the familiar rectangular vision of 35 mm format. For these two reasons, each frame I exposed was conscious and deliberate. Another choice was to set up a makeshift studio in the GAPA centre in Khayelitsha, with a plain white backdrop for each of the grandmother participants. This was deliberate and conscious. I did not want the women to be portrayed in their usual environment. Each woman decided on her own 'presentation of self' by selecting her own attire for the photographic shoot. I wanted to portray the women as much as possible as they wished to be seen. I intended to separate them from the traditional cues of their homes, the indicators, the presence or lack of money, poverty, brick home or tin shack. For the most part, they presented themselves with a quiet dignity. In some cases their pain, or mischievousness, welled up or sparkled in their eyes. That process resulted in the individual portraits that form the foundation of the 'Nevergiveups' exhibition. The portrait sessions set up at the GAPA building in Khayelitsha turned into a series of social encounters replete with humorous banter flowing between the other grandmothers gathered in the room, and the 'subjects' of the day. Grandmothers arrived for their scheduled sittings and we re-engaged some of their narratives recorded at the first group meeting. I checked with them about what we had recorded. The purpose was twofold: to ensure the accuracy of the quotes that I was planning to later use as inscriptions on their photos, and to re-engage each woman on a one-to-one basis, to re-assure her about the photo session and confirm her willingness to participate in the process. The social atmosphere merged with the physical space established for the portrait shoot. 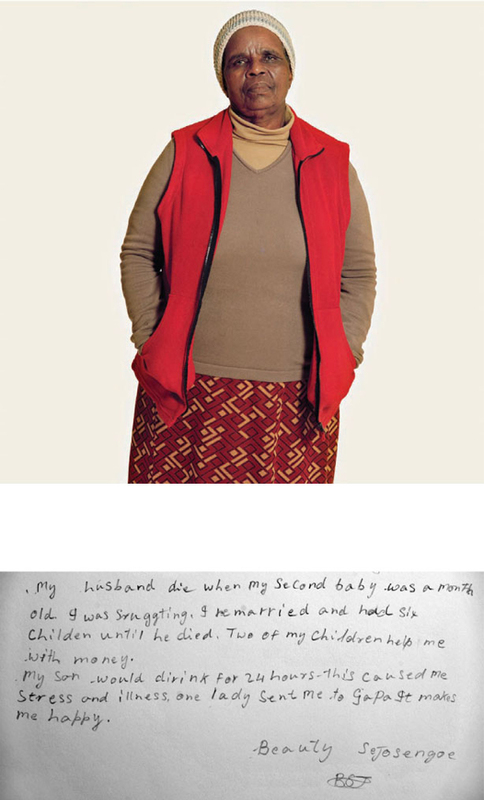 Although my original intention had been only to photograph a series of individual portraits, It became apparent as we worked with the grandmothers, and as Jo-Anne engaged in longer interviews with them, that the series would be incomplete without a parallel collection showing them with the families they supported at home. We learned that so much of each grandmother's life centred around daily tasks of caring for children and grandchildren affected by the pandemic. We wanted to chronicle the magnitude of the extended families and communities held together by the strength of each grandmother. In order to depict this relationship between grandmothers as iconic figures of elder womanhood and their strength as leaders within their communities, I shifted from capturing these 'gogos' as subjects in a constructed studio space, to trying to illustrate one significant component of their lives in their own social contexts. Over the course of more than a year, I visited the grandmother participants in their homes, as they gathered their children, grandchildren, and in one case, husband and family dog, together for the family portraits. The logistics of this presented a series of pragmatic challenges. With families of sometimes up to ten, twelve or more people living together, it was an enormous task arranging for each member to be present at the same time, and long enough to sit for a photo. Despite sometimes visiting families two or three times, there were moments when it proved impossible to photograph the entire family together. Some were working night shifts, others were out of town. Some had to be activated from the day-time drowse of the unemployed, or retrieved from neighbourhood friends or shebeens. Yet, even as this process presented obstacles, my relationship with the grandmothers in this project continued to grow through the expansive moments I had shared as a witness to their fuller lives. It was concurrent with this, that Femina magazine asked us to create a piece for them focusing on one woman, 'A Day in the Life of . . .' narrative in the first person - to take their readers into the home and life of one grandmother. This took both Jo-Anne and I into another level of engagement with the grandmother who volunteered to participate in this, Alicia Mdaka.1 In general we (the non-poor) attribute a range of characteristics to people who live on or below the poverty line ... 'Their lives are miserable, they don't have enough food to eat,' we believe. 'They squash three or four to a bed, eight or ten or more to a shack or house.' Stereotyped images and ideas of relentless squalor ... we cannot, do not, visualize the deeper reality of their daily lives. There is nothing romantic about eking out a living, about being poor, about struggling to feed, clothe and house a family. Yet there are things that happen within that family that are usually beyond the access of outsiders. So, when we asked Mrs. Mdaka to allow us in for a day, for a 24-hour cycle of her life, and to literally ignore us, to not offer or make tea, or meals for us ... to just pretend we are not there in the most literal of ways, she did. We 'disappeared' inside this small four-room house with running water and drainage outside, and ten residents inside. We disappeared to them all. We became as close to flies on the wall as we could realistically hope to achieve. And over the course of just one day, we absorbed the privilege of watching a family 'at work': cooking, laughing, bathing, eating, being bathed, talking, cleaning, singing, ironing, praying. 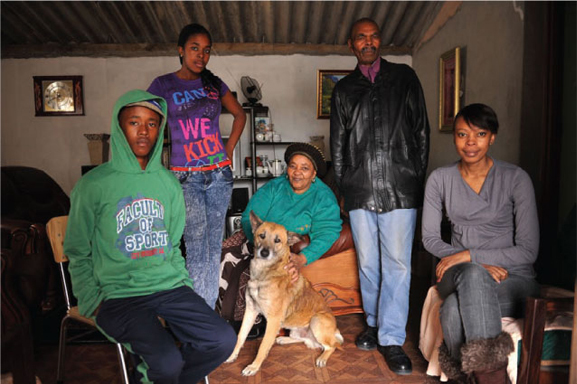 We watched the wealth of this family - emotional and non-material - being shared and enjoyed by them all in abundance. To some extent it was this engagement that separated my work on the 'Nevergi-veups' project, from work I have done previously. I have spent the better part of my professional life working in communities such as Khayelitsha, both in South Africa and across the continent. I have experienced almost the full range of what life entails throughout Africa. But my work with the grandmothers stands out in several respects. First, I have never before spent so long working so intensely on one project. I have never before had the opportunity to create relationships with my 'subjects' in the manner in which this work has demanded. It has not always been easy. JoAnne and I have met, formed relationships with, filmed and interviewed many of the children and grandchildren of the grandmothers. Some of these young people have subsequently died. I have visited some in hospital and been to the funerals of others. I have tried - albeit sometimes clumsily and quite possibly on occasion in culturally inappropriate ways - to support and empathise with grandmothers in their losses and their struggles. I would like to think that all the years of moving in and out of communities such as the grandmothers', has in many ways prepared me for the intensity of this engagement. But I also remain conscious that there are many times, sitting in peoples' homes, that I am clearly the guest, the outsider, and I make no pretense about that. Despite the closeness of some of the relationships created, this is simply the reality of our engagements. Yet our short immersion, the process of documenting the life stories of South Africa's grandmothers - who are holding an incredible history of social struggle under the apartheid regime while caring for the existing generation as it confronts the AIDS pandemic - provided a shared experience of contributing to a social archive, far beyond the initial intent of the single story we set out to cover in 2010. The process of engaging with, and uncovering the lives and histories of the women who allowed us in, proved to be enriching, distressing, and illuminating. And this is precisely what we hope the products of our extended labour will be to the readers. The penny dropped when we were interviewing Mrs Skefile for notes to accompany her portrait. She was one of the seventeen women from Grandmothers Against Poverty and AIDS (GAPA) who had volunteered to be part of the 'Nevergiveups' photo exhibition, featuring the grandmothers and their families. Elderly women are picking up an outsized share of the burden of AIDS and poverty in South Africa, caring for their AIDS-orphaned grandchildren as well as providing for their own jobless, and sometimes ill adult children, with few resources other than their government pensions. These women often fell ill themselves, and frequently felt overwhelmed by their huge responsibilities. But the members of GAPA said the organisation was 'keeping us alive'. They told a deeply moving story of problem-solving and a determined, committed sisterhood, which provided them with an extremely empowering network of support. It was after we had written several news stories that Eric decided to put on an exhibition about the grandmothers. As he focused on taking a series of portrait photographs, I documented their stories, asking them to recount the most important events in their lives in their own words. Hearing these key events, we realised that these stories, too, were shared by a large proportion of the women of their generation. That was intriguing, but it didn't strike us as of any further significance. Then came Mrs Skefile. To sit for her portrait, she wore a white towel wrapped around her head as a headscarf and a turquoise Mad Dog tracksuit top (see page 245). The makeshift wardrobe demonstrated her poverty, but she had a defiant glint in her eye and laughed easily. 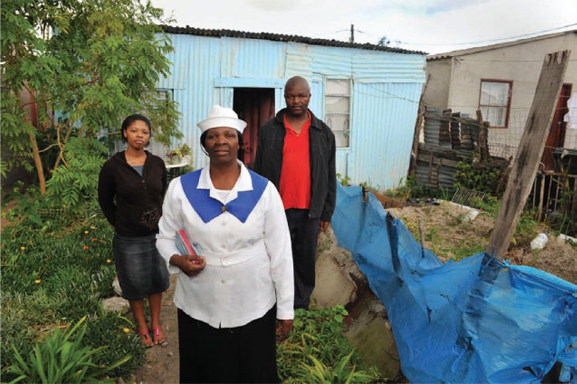 She described running away from an abusive husband with her five children, coming back to Cape Town, where she was born, and later scavenging on rubbish dumps for eight years to feed her family. 'And now I am proud, because I know what it is to live hard,' she said, her chin raised, her face stubborn. Chills ran down my spine - the kind of chills that tell me I'm hearing an extraordinary story. I turned to Eric. 'This is a book,' I said. 'I was wondering when you'd say that,' he replied. And so began our three-year journey, investigating the life stories of a few of the grandmothers, from childhood to old age. For me, this was a culmination of years of work as a health writer for the Cape Times and a freelance writer for newspapers and magazines. As a newspaper journalist, I wrote largely about HIV/AIDS, its increasing toll on South African families and communities, and the responses of provincial and national government - the latter refusing, for many years, to provide the anti-retroviral drugs that had already emptied AIDS wards in developed countries. This newspaper work consisted largely of 'hard news' writing. During those years there was much heady drama interwoven with the opportunity to tell stories of great importance to society. However, no other project provided the level of in-depth interviews, and the opportunity for creativity, that I experienced in working with the grandmothers of GAPA. My encounters with GAPA began after I started freelance writing, when a nongovernment organisation called the Foundation for Contemporary Research asked me to write a piece investigating whether elderly people's Constitutional rights - to dignity, equality and freedom - were being fulfilled. This led to a piece on elderly people of all backgrounds increasingly becoming caregivers, and the poor having the largest burden, because many of them had to care for their AIDS-orphaned grandchildren and unemployed adult children. As part of this investigation, I met the grandmothers at GAPA, who featured in the subsequent media stories that Eric and I worked on together. Then came the exhibition - and the revelation, brought by Mrs Skefile, that the grandmothers' life stories deserved a book. For the exhibition, we selected key quotes from each grandmother's interview, and asked her to pencil these quotes on the final portraits. The end product combined image and voice, the variety of quotes giving some idea of some key trends in the grandmothers' lives. The book needed fewer subjects but more detail than the exhibition. Choosing the grandmothers to interview was challenging, as we had developed ties to many of the seventeen grandmothers in the original project. Eventually, we focused on just six grandmothers for the book, purposefully selecting women with different life stories and personalities. Most of the grandmothers we interviewed did not finish school, although they said they earned good marks and held ambitions to become teachers, nurses and social workers. Their families' poverty, or the belief that girls should get married rather than finish school, cut their education short. All of the women had children young and all but one had to travel from the Eastern Cape to Cape Town, or another large South African city, to work as domestic workers to provide for their children. Most of them were single mothers - the husband of one died, those of a few others were abusive, and the other men left them. Their struggles were personal and political, as when they sought work in the cities, the state-imposed apartheid police tried to arrest them, repeatedly. All of these constraints meant that their opportunities were extremely limited. However, they were not thwarted. With a mixture of ingenuity, determination and resignation, when they had no other choice they soldiered on. 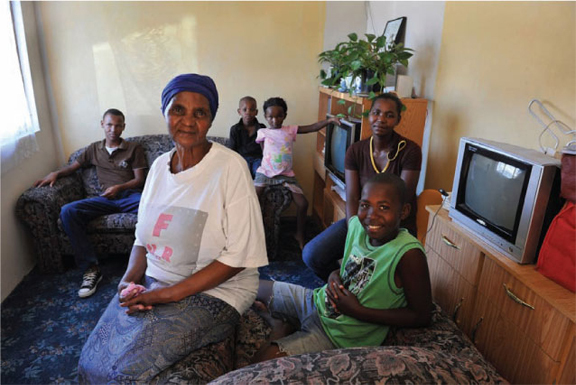 These women, and many others in their generation, had to make many transitions: between rural and urban areas, African and Western cultures, the apartheid and the post-apartheid eras, and from a time in which the elderly expect to be cared for, to one in which they were once again thrust into an intense care-giving role as heads of families. 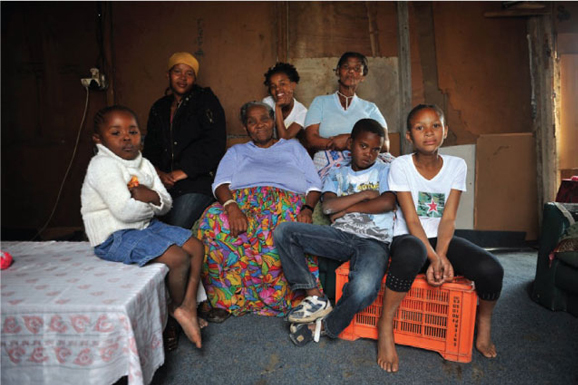 The women in this project all had to navigate these changes, although the stories differ widely according to their family backgrounds, personalities, and the differing extent to which Xhosa culture determined their life histories. Thenjiwe Tutu describes how black women used to fold up blankets and put them under their dresses or on their backs, to make it seem as if they were pregnant or carrying a child, so that the police would not arrest them for being in the cities without a pass. 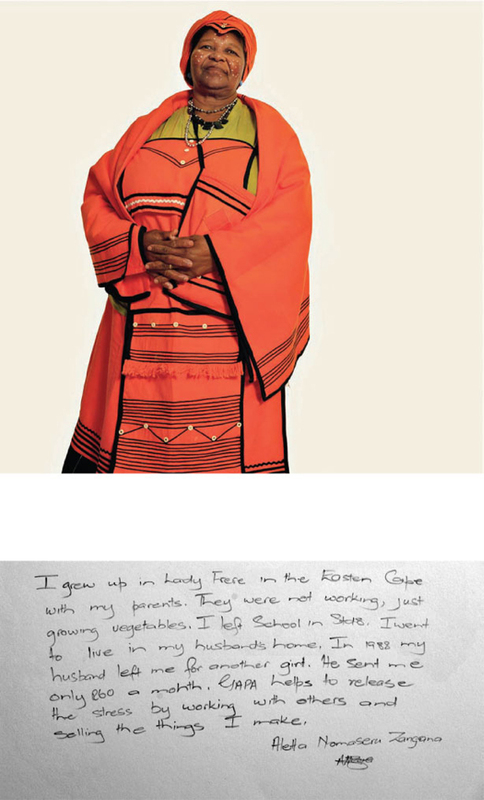 Nothando Kubukeli described happy years as a shepherd with her sister when she was young, and the subsequent calling, through ancestors' voices in her dreams, to become a sangoma. Goldie Qayiya described a host of Xhosa customs, from how families preserved meat without a fridge, to how people sat in circles on the floor and shared a single bowl of meat, passing it around, rather than each eating from their own plate, and an innovative way of distributing wedding invitations to an entire village. A schoolchild would take hosts of tiny invitations to the principal, who would give one to every child in the school to take home to his or her family. As we filtered the stories of the original seventeen grandmothers so that we could choose six for these extensive life histories, we found that one or two seemed dwarfed by their own suffering. Others had plunged to the depths of grief but seemed able to regain their sense of purpose with an astounding resilience. It is hard, and probably foolhardy, to try to analyse all the reasons enabling them to do so, as so many factors play a part. Several of the women said they found such great joy in being with their families and grandchildren, that it made their lives worthwhile. Interestingly, all of the women who held a largely positive attitude described the huge boost of getting a house from the government. A house meant protection from fire, criminals, and even fleas; shelter against the roaring Cape winds and the driving winter rain; a sense of dignity, and hope for security in their old age. Their houses gave them a huge psychological and practical boost. Without the country's extensive social welfare system - old-age pensions, children's grants and disability grants and, very importantly, their houses, all given by the government - they would not cope. These practical resources are a great help, but not enough. As we learned from the interviews and related research, these grandmothers, and others across the country like them, play a heroic role in caring for their vulnerable families, thereby keeping much of society intact, but they get little support for this particular burden - other than in organisations such as GAPA. 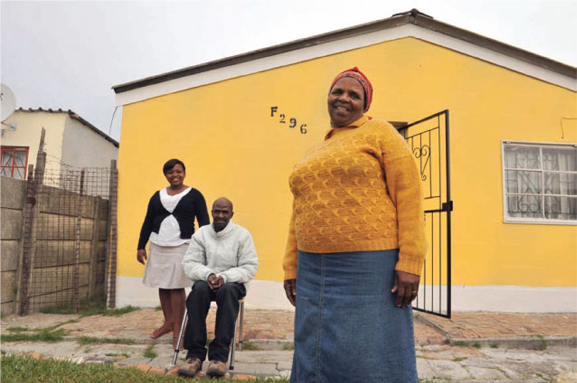 In his doctoral thesis on the subject, George Sabela Petros of the Walter and Albertina Sisulu Institute for Ageing in South Africa, outlined a host of ways in which the authorities could strengthen the grandmothers' abilities to cope, which, in turn, would help them to bring up their grandchildren well. GAPA is fulfilling many of these functions, but most grandmothers do not have access to such an organisation. Part of the activist intention of our work is to help promote the development of more GAPA organisations. The grandmothers we interviewed described events I will probably never have to experience, in soft, resigned, sometimes humorous, and often regretful tones. While writing some of these excerpts, I felt stunned and had to stop, sitting still and quiet for a few minutes, to take in the impact of what I had heard. At other times, each phrase felt like a little spear to my heart. Working at this level proved to be a labour of love, and a slow process. We travelled to Khayelitsha at least six times to interview each woman, first asking her to describe the most important events in her life and then going back to ask many questions to flesh out these incidents. It was a joy, after the typically time-constrained interviews of newspaper and magazine journalism, to let the stories unfold gradually, at an unhurried pace set by the grandmothers rather than ourselves, and to allow ourselves to be sidetracked by the many tributaries that make up the course of a life. Each interview led to a fresh discovery, opening a door to another story that surprised, saddened or delighted us. This was the first time I had relished and crafted stories to this degree, getting all the detail that I could and then imagining living through the experience myself, so that I could write it in the first person. As a creative exercise, this process was deeply satisfying, although I had to check all my imaginings with the grandmothers, to make sure I had not misrepresented them. We visited each woman to give her a copy of her story, and be sure she was happy with the final product. The interviews were laborious at times because I hardly speak any isiXhosa, and many of the grandmothers have limited English. We did not employ an interpreter, as this would have been very expensive, and we were spending our own resources on travelling and all the expenses entailed in our work. During the interviews, I kept having to rephrase what each woman said, to be sure my understanding was correct. Very slowly - sometimes with the help of some very articulate, very sparky grandchildren - we found the right words. Very importantly for me, we ended up with stories that are largely positive and inspiring. For all of the challenges these women have faced, and for all their lack of political and social clout through much of their lives, they have a courage, warmth and quiet confidence that I find deeply inspiring. Their stories are cameos of resilience and strength of character. The grandmothers in these stories have shown me that suffering may almost cripple us, but when we manage to crawl, hobble and eventually even run onwards again, how magnificent an achievement every step is. 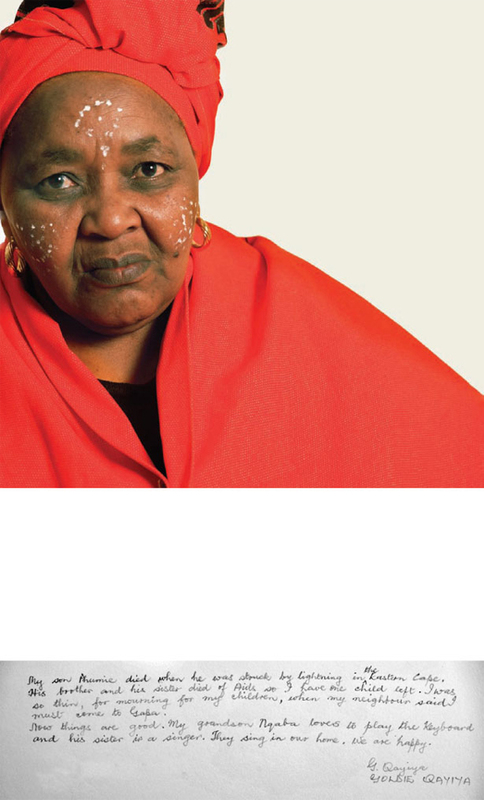 Grandmothers Against Poverty and AIDS became a model for teaching social history, gender, race and class relations and women's community-based activism in South Africa. I met with GAPA leaders in 2005 when I set out to develop a course on social development in Cape Town. My pedagogical approach drew from a scholar-activist perspective that merged teaching and learning with 'giving back' to societies through social justice organisations. This perspective required that students interact hand-in-hand with community leaders and immerse themselves in the day-to-day landscape of such a complex society. After working in South Africa since the 1994 transition, I could find no better teachers of the complexity of social life and the resilience of women's force than the leaders of GAPA. Since 2005, GAPA has become a teaching site for over fifty U.S. university students interested in understanding how women are carrying the continued social transition in South Africa. While working closely with grandmother activists, my students have learned social research skills by documenting the lives of GAPA leaders, creating short films, and leading fund-raising projects to support GAPA's wider organisational goals. While the GAPA model became part of my teaching in the U.S. and my own continued research on women in post-conflict transitions, the content of what my students and I captured called for a wider educational awareness campaign to illustrate both the resilience of elder women and the price they pay on the frontlines of the AIDS pandemic. In efforts to capture these complexities, I taught students how to record life histories, lead focus groups, designed reflective writing workshops with grandmothers, and placed a few students at GAPA for a month each year. Beyond the skills they acquired, our larger purpose derived from a scholar-activist attempt to 'give back' to the larger causes of HIV/AIDS reduction, community education and women's empowerment all of which have been central to this organisation's mission. As a public sociologist and gender activist, I had always envisioned doing 'some- thing more' with GAPA, beyond the scope of traditional sociological research. While my students and I had established a substantive collection of narrative data, the scholarly venues that grant academic credibility through peer-reviewed processes posed internal complications for me, as I struggled to step back from the life stories the grandmothers of GAPA shared and 'analyse' their existence in the more traditional scholarly writing format. The depth and layers of complexity in each grandmother's story merited so much more than the standardized forms of knowledge production valued within academe. I wanted to develop a project that would have meaning for the grandmothers in GAPA rather than producing a traditional academic piece that would live on the shelves of a U.S. library. 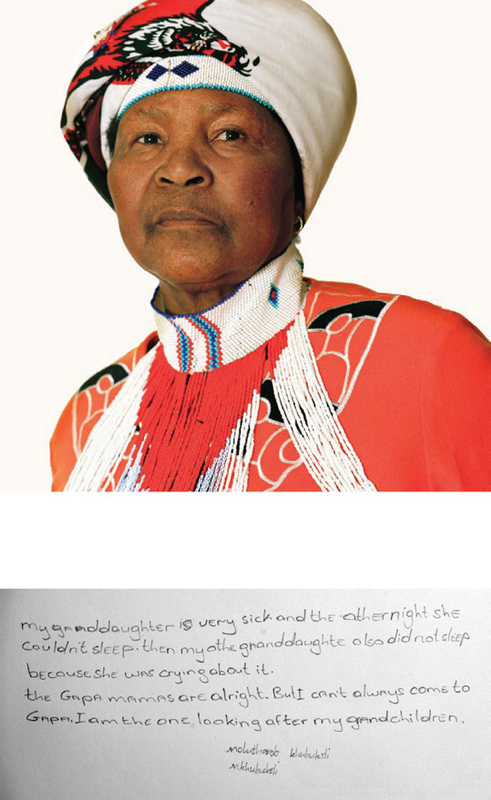 In 2009, during our 3-week course immersion with GAPA, Althea Barry suggested that I connect with 'some well-known South African journalists', who had begun a combined portrait-interview project with seventeen grandmothers. When Eric, Jo-Anne and I met in person, the synergy of our desire to create a larger project that documented the lives of the GAPA 'gogos' revealed the possibility of merging journalism, photography and academic research with a collective commitment to social documentation as a form of activism. Eric's initial seventeen portraits conveyed an emotion, complexity, colour and a collective spirit that captured the larger story of GAPA's grandmothers through an immediately accessible visual language. This artistic component added an entirely new dimension to my work, which had formerly focused predominantly on narratives as the means to 'tell the story' of the dialectic relationship between social inequality and collective resistance. In sharing the portraits with colleagues and students in the United States, I learned that it was the visual element that best portrayed the context of grandmothers' lives, which later become central to the activist component of our shared project. Eric's continued photographic documentation was well underway, yet we needed more time, resources and focus in order to create a venue to exhibit the lives of South Africa's grandmothers in ways that served GAPA and the larger struggles of so many elder women - who are picking up the pieces of this global pandemic. We set out to draw together enough resources to support an exhibition, which would afford a public and shared space to combine our three vantage points in a larger portrayal of the lives of the grandmothers behind the organisation. The immediate fund-raising needs became the concrete project of my graduate student, Savannah Eck, who proclaimed that 'GAPA changed my life' after working with the organisation for nearly a month in 2010. Savannah's entrepreneurial spirit and tangible marketing skills took form as soon as she left her service-learning experience in Cape Town. In October 2010, Savannah developed the material she had drawn from her time at GAPA to launch the 'Supergrannies' Kickstarter online fundraising campaign as a means to promote awareness of GAPA and draw resources from sympathetic donors throughout the world. As a professor I felt that her commitment, foresight, critical consciousness and overall motivation encapsulated the model of global citizenship and engaged scholarship I hope to inspire through cross-cultural service learning. Throughout this process of widening the public scope of this scholar-journalism-activist project, we continually wrestled with questions of representation - a struggle central to feminist research. How could we best bring awareness to the lives and larger social disparities we wished to confront, without reproducing quintessential images of 'poor, black grandmothers in Africa?' This question carried distinct resonance in the U.S. context, where the added dimension of HIV/AIDS constructs complex and problematic representations that fall to women in ways that reproduce former social divides. To deal with this struggle, Savannah and I worked together with Eric and Jo-Anne to determine how best to 'tell the story' of GAPA, without developing an empathy campaign that hinged upon the construction of poor black womanhood in South Africa. We wanted to share the resilience of the GAPA grandmothers in ways that conveyed the realities of the crisis they confronted, yet held their positive spirits at the forefront of the story. In a sense, we needed to 'sell suffering' to a certain extent, in order to realise our larger goals. We launched an online campaign that mediated this tension through the use of Eric's photographs. While some of these images presented the extreme circumstances surrounding grandmothers' lives, my university colleagues, family members and friends found the project 'inspiring', 'amazing', and 'so uplifting'. A 'personal coach' from Toledo, Ohio, who had never even travelled outside of the U.S., volunteered to offer her services to be sure that we realised our fundraising goal. As a combined visionary-public relations team, we were amazed by the outpouring of support for GAPA from a wider community that could connect to the story through deeply held affinities and collective memories of their own grandmothers. We realised that the role of grandmother itself somehow carried this project, at times with a life of its own. After a series of virtual updates from Khayelitsha, we garnered enough support to open two exhibitions. This form of scholarly production took on a new dimension through its collective and interactive format. 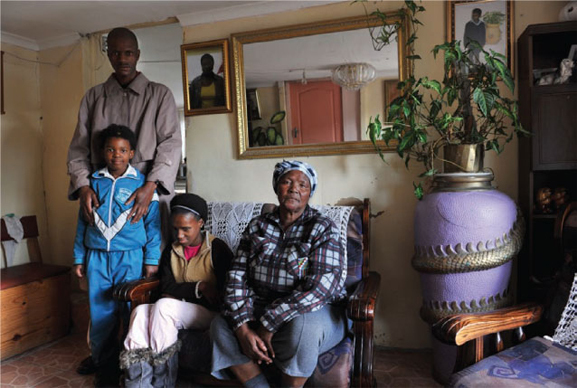 In 2011 twelve students from Old Dominion University in Virginia hung Eric's framed individual and family portraits in seventeen coupled series at the District Six Museum in Cape Town. From a teaching perspective, the ability to see how students could integrate the larger contexts of severe social inequality, the organizational role GAPA served in post-1994 South Africa, and the individual lives depicted so astutely through the combined visual-narrative portraits allowed me to reflect on the value of the exhibition as a hands-on encapsulation of all of the levels of integration I had hoped students would acquire in their immersion experience. Furthermore, in the larger context of so many 'unan-swerables', the activist model Eric and Jo-Anne provided showed students the value of choosing a cause, building meaningful relationships, sticking with it, and realizing some tangible dimension of completion. One of the most remarkable aspects of teaching this exhibition transpired when students observed the reactions grandmothers expressed in seeing their images displayed so prominently in a collective exhibition space. As Nompumelelo Beatrice Mwanda, a GAPA group leader, exulted, 'I don't believe my eyes, what I am seeing today, it is beautiful, that GAPA is here.' I watched the grandmothers walk my students through the exhibition pointing out the members of their family portrayed in the portraits. When Eunice Mase pointed to her granddaughter and said, 'her mother died of HIV/AIDS and this is her daughter', I felt certain that this moment crystallized my students' ability to understand the vital relationship between social hardship and the capacity to celebrate survival and resilience. The visual-narrative forms provided an intimate lens for students, grandmothers and visitors to experience both the detail of individual images and the wider collective impact absorbed in the entirety of the exhibition. Throughout the evening, my students documented grandmothers' reactions to seeing their own images portrayed in such a public, and historically significant, venue in the city centre. Not only did the images and event tell the story we had envisioned, the grandmothers themselves became a moving performative dimension of the installation. They danced, sang and recounted moments along the journey from the vision to the reality of the 'Nevergiveups' project. As we work to take this exhibition to the United States with members of GAPA, we reflect upon the value of merging journalism with scholarship and activism in ways that provide a social documentary archive and contribute to a wider social justice cause through our respect works. While our professional perspectives bring diverse vantage points to the project, we were equally transformed by the respective relationships we established with GAPA. Our hope is to continue this work as a model of creative scholar activism - where journalism, photography and social analysis merge to provide a richer archive that depicts the complexities and the depth of GAPA's model to nevergiveup. I never thought I should have stayed, not once. How could I, when he was treating me so badly, beating me when he came home drunk and forcing me to make tea for his new girlfriend? Anyway, I was going back to Cape Town, my home. The years that followed were very hard. I did not expect to end up on a rubbish dump, scavenging for things to sell for recycling, to feed my children. I could not foresee I would spend so long fighting with the police in Crossroads, because they were chasing us black people away from there. But I do not regret these things. I did what was right for my life. And I did what I must, to survive. We learnt what it is to live hard, me and my children, but we did survive. So now I am proud. Victor was my first and only boyfriend. A few months after we met, when I was twenty, we got married. It was a white wedding and I had a beautiful white dress. All the people in the community came, hundreds of them. It was very good. For the first ten years of our marriage, we were happy. Victor was a policeman, and he bought clothes for the children and me and supported us in every way we could wish for. But then he resigned, wanting go back to Qunu in the Eastern Cape, where he came from. For a while everything went well in Qunu. We lived in a house made of bricks and we ploughed mielies and pumpkins. We were never hungry. But Victor didn't have a job anymore. Maybe that made him depressed. At any rate, that was when he started beating me. He came home drunk and when he saw me sitting there with the kids, he asked me, rudely, 'Where is my food?' Then he started quarrelling with me, asking me questions just to pick a fight, and then, every time, he must hit me. He decided to marry a second woman, the wife of his brother who had died. This is a Xhosa custom, but for me, it was unbearable. At times he would order me to make tea for this new girlfriend, Gladys, in my own house. If I talked back, he hit me. There was no more love in my marriage, so I packed my bags. Better to struggle in Cape Town, my home, than there. In Cape Town, I had a job for eight years with Mrs Dodson, a very nice lady, in Green Point. But then she went overseas and I could not find another job. A friend of mine in Crossroads was going to the local rubbish dump every day. 'You'd better come with me,' she said. 'It's better than nothing.' So I went with her. Old clothes, plastic shopping bags, rotting food, vegetables, even sometimes a rotting dog - it was all piled up in the big brown mountain of the dump, stretching as far as we could see. That first day, walking onto the dump with the other women, I felt sick all day and couldn't stop vomiting, the smell was so bad. For ten years, from 1972 to 1982, we worked on that dump. Our job was to pick up broken bottles, cardboard and plastic and sell it for recycling to an Indian man called Mr Faro, who was waiting at the edge of the dump. In winter, when it rained, our legs sunk into the mess of rubbish. Yoh, it was horrible. But I couldn't do otherwise, or we would have no money. If you've got kids, they keep on needing food. Then you must go and buy bread and everything else all over again. We had very little, but I had a lot of clothes, the ones I found on the dump, and we dressed like ladies, you know. Working on the dump, we never fought, we were always laughing. The one would say this thing, the other one another thing, and then we laughed. The one would pick up something, maybe some clothes, and say, 'Mrs Skefile, take this thing for you.' That was marvellous, even though the place was stinking. You have to be proud of yourself when you've got nothing, and you make use of what God gives you. 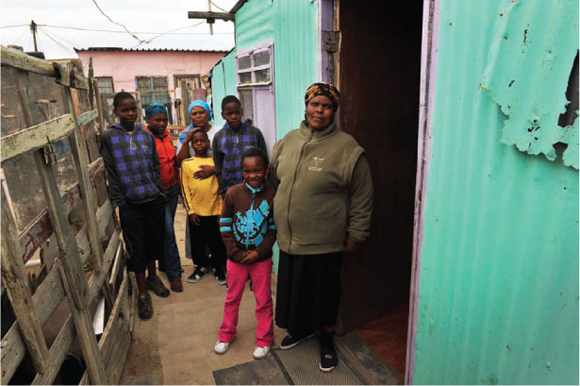 For some of those years, we were living in a backyard shack in Gugulethu. But then we had to leave because we could not always pay the rent. Crossroads is now a very big informal settlement, but we were one of the first families to go there. We had to cut down the trees, to make room to build a shack. My daughter Nomhle and I learnt how to do this from some boys there. They had made their own shacks out of sticks and a big brown piece of railway canvas. We found a piece like that on the dump. For years - I don't know how many years, maybe six, maybe eight - we lived in that canvas shack, with sticks holding it up. But we had to hide it every day, because the police kept coming to find us. They said Cape Town was just for the white people and they were always trying to chase us away. So at half-past five every morning, we had to wake up and pull the shack down before the police inspectors came. Then we hid everything we owned beneath some rocks, to stop the police destroying it all. Later, when they went away, we had to rebuild the shack all over again. We had to do this every day for about four years, because if the police found our shack they just pushed it over, trying to ruin it. They even came with their dogs. Sometimes they came during the day and sometimes at night, many of them at once. And when they came at night, sometimes we were naked and we ran, just like that, because the dogs were running after us, running after us. We just had to get up and go. One day I fell and they bit me here on my leg. I was very angry, very angry, and I was crying, I was crying. The dogs bit me two times. I took Dettol and wash the bite with it and bandaged myself up. I don't know what we had done, that they didn't want to give us a place to stay, just to chase us with dogs. We could hear when they were coming, with their sirens going, 'Whee, whee, whee'. The first person who heard them shouted out 'Kubomvu', meaning 'It is red, they are coming!' It was a warning, us black people's warning to each other. He never answered me. Then he went away. It was the last time he came. What I said was true. I can't be sure why they didn't come again. There were many things happening at that time. But after I said I was born in Wynberg they left us and we put up our shacks and stayed there. And they did not come again. Now I have my own house in Khayelitsha. For money, we have my government pension and the money I sometimes make from sewing at Grandmothers Against Poverty and Aids, and my daughter Zodwa's disability pension. She can't talk easily, because her tongue is attached to the bottom of her mouth. She was born like that. My granddaughter died of Aids when she was 26, and we never knew why she was sick. I like going to Gapa, to help me deal with all the difficulties in my life. We talk a lot about our worries there and soon you've forgotten you've got any worries at all. This one says one thing, another one says something else, and soon we're all laughing. My grandchildren Luyanda and Zanele live with me, and looking after them makes me happy, so things are alright now. We are still hungry sometimes at home, and I still worry about my grandchildren. But we are close. We laugh a lot. We play a lot of games. Having my family with me makes me happy. Those bad things from the past are not happening anymore. Things are a bit better. I'm like a person, now. 2 This story consists of edited extracts from a full book chapter on Mrs Skefile's life.